In 2010 I bought an AstroTrac and have enjoyed using the AstroTrac since then. When the AstroTrac was announced it was the only easily available ultra portable and accurate tracking mount. It was the first of a new breed of mount sufficient for wide field astrophotography yet extremely compact and portable. There were some other compact equatorial mounts available but they were much harder to come by with short production runs or not being commonly available for one reason or another. Since the release of the AstroTrac the market of ultra compact portable tracking mounts has expanded significantly to now include well known brands iOptron with their EasyTracker and Vixen with their Polarie. Losmandy also produce a “Star Tracker” but being basically half a GM-8 I don’t consider it ultra portable. The most widely used options currently seem to be the AstroTrac and Vixen Polarie (based on my observation). In July 2013 I acquired a Vixen Polarie to complement my existing AstroTrac mount. My main reason for buying a second ultra compact mount was that the Polarie is less than half the size of even the AstroTrac meaning I would be able to fit it in my normal camera backpack with no dedicated case (albeit a small one) like I have for the AstroTrac. Having now used the Polarie along side the AstroTrac I will comment here on the differences and what is good and bad about each mount. Certainly I think each mount has its place, its pros and its cons, and to my surprise the newer Polarie doesn’t rule the roost in every way. In this review I consider the AstroTrac + Wedge as one complete kit and compare that to the Polarie. You could argue this is unfair, but the fact is the AstroTrac has a purpose built wedge which is attached in such a way you would not frequently want to disengage them, they become essentially the one component. This for example means the AT is perhaps more stable than the Polarie at equatorial angles but means the AT in my comparison is much more expensive. Having said that, consdiering the cost of the Manfrotto Geared Head people usually use instead of the wedge for both mounts the AT wedge is actually priced well. It is quite plain to see from the image below and official dimensions published by each manufacturer that the Vixen Polarie is a smaller than the AstroTrac. The AstroTrac reqires a case about the size of a trumpet case (often Trumpet cases are used) for secure storage, whereas the Polarie is similar in size to a DSLR camera. The shape of the Polarie makes it fit easier in to a camera backpack or the like along with other gear. It is also worth noting the Polarie feels less delicate than the AstroTrac due to the simple box construction of the Polarie vs the long arm construction of the AstroTrac. I don’t hesitate putting my Polarie in my backpack among other things, but would always transport the AstroTrac in a case protecting it from hard knocks, twisting/bending and compression even though I have never damaged my AstroTrac. Both the Vixen Polarie and AstroTrac have external battery capabilities via simple cables. 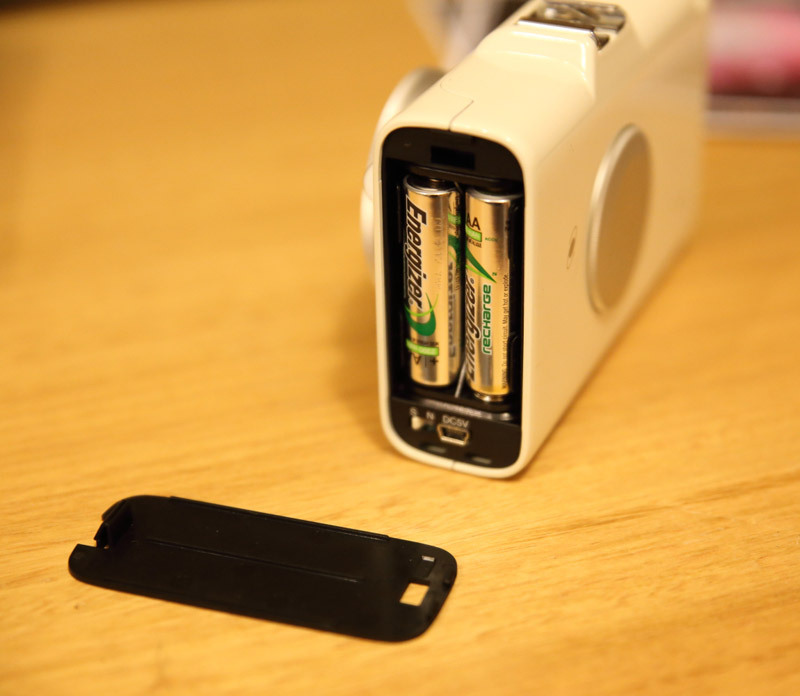 The size of the external battery you choose is entirely up to you, and can be anything from 4xAA upwards. Personally I have always used a 6Ah SLA with the AstroTrac because it works well as a stabalising weight hanging on the tripod, and for providing power to dew heaters. The difference between the units comes in that the Polarie has a built in 2xAA battery bay whereas the AstroTrac has no built-in battery compartment. Two hours is not a very long supply period, but it can be enough, and can mean the differene between needing to carry something extra (another battery) or not. Regarding battery run-time, consider that while the Polarie may only have two hours of internal battery life that two hours may in fact be sufficient for a whole night of use. This is because if you are doing nightscape photography which includes horizon or foreground you will not always be photographing with tracking turned on. You may also spend a significant portion of the night walking to different locations rather than continuous tracking use. I recently spent from 8pm until 2am using the Polarie and the 2 hours of battery life was sufficient for that time. This is the first winner for the AstroTrac and not for an obvious reason. Both mounts have built in capabilities for polar scopes. The AstroTrac has the wedge having fine graduations of degrees while the Polarie has a built in level indicating what degree the unit is tilted at. The Polarie has a small sight hole you can look through if not having the polar scope. Both are quite easy to glance at from a couple of metres behind and determine they are pointing roughly in line with the celestial pole. The difference is in where the polar alignment scope is. To use the Polarie polar alignment scope you need to take the camera off. To use the AstroTrac polar alignment scope, you swing out the arm and leave your camera exactly where it is. Vixen Polarie with laser for alignment. The camera would ordinarily sit where the laser is positioned. I believe the polar scope (if purchased for the Polarie) would be placed in the same position. Alignment laser swung to the side of the AstroTrac with camera still attached. Consider the scenario – you walk to a location, plonk down the tripod with mount and camera still attached from the last spot you were at 10 metres back. Now you need to align the mount with the celestial pole. With the Polarie you either take a good guess looking at it from behind or through the sight hole (which is very vague), or detach the camera and replace the polar scope. With the AstroTrac it’s a 1 second flick of the hand to swing the polar alignment arm out. 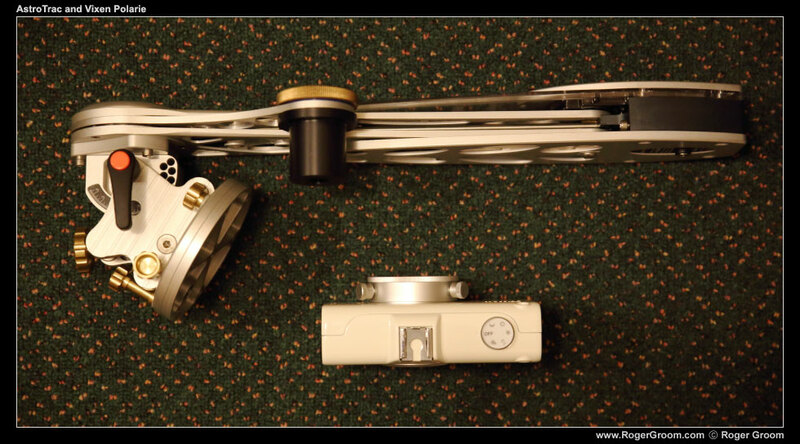 Taking the camera off the Polarie to use the polar scope is a multiple step procedure: 1) take the camera off the ball head you have on the Polarie 2) use the two thumbscrews to remove the ball head and mounting plate from the Polarie 3) remove the compass from the back of the Polarie. The sight hole available on the top right of the Polarie is rather unhelpful from what I have found. I find it just as accurate and easier to stand a couple of metres back and sight the mount with the Pole. That is, if you are not wanting to use the polar alignment scope/laser. I found pointing the laser through the sight hole does not help due to the rounded edges of the Polarie unit and the wide nature of the sight hole. Note: I don’t use a polar alignment scope, I think they are possibly the most awkward man made invention for the southern hemisphere inhabitants. I use a laser in place of polar alignment scope. I think the laser works at least as well in place of polar scope for any mount. AstroTrac: Off, Sidereal, Lunar, Solar. Polarie: Off, ½ Sidereal, Sidereal, Lunar, Solar. The critical difference: The Polarie allows you to start and stop tracking with a simple turn of the dial. You can start or stop it any time you wish, and when you do it does not change the position of the camera. There is also no re-wind required with the Polarie. How does this differ from the AstroTrac? 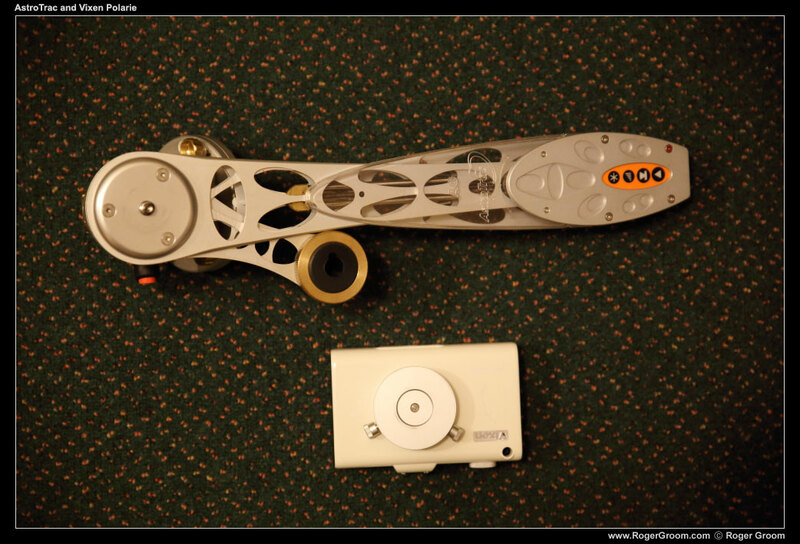 The way the AstroTrac works is to move along a tangent arm. To start, it winds forward for about 10 seconds to stabalise the tangent arm. To stop you can either pull the power cord out (and will be forced to rewind the mount upon power-up) or re-wind the mount at which point it will stop once rewound. This is probably the most contentious comparison in my review because I am comparing the AstroTrac with it’s Wedge against the Polarie with a Manfrotto head. But, the fact is AstroTrac provides a purpose built competitively priced solid wedge, where as Vixen does not. 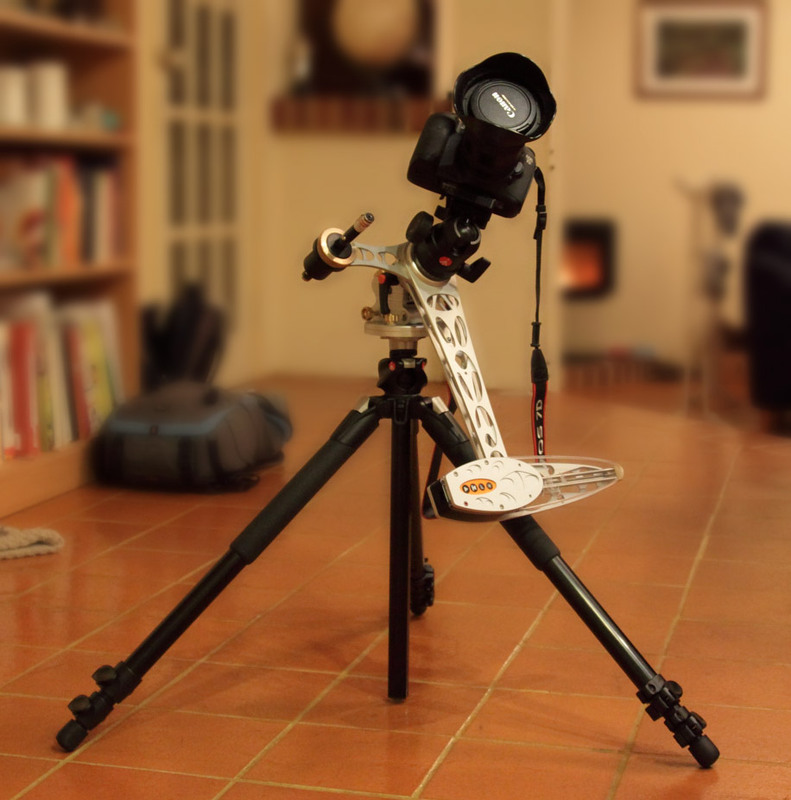 I have mounted the Vixen Polarie on a Manfrotto single direction tripod head. This works well except the contact between Polarie and quick release plate is too small (see stability section below). The ability to adjust the angle is fine. Either way, this is an optional and third party component. The AstroTrac has available, and is included in this review, the purpose made wedge. This wedge is solid, well constructed and easy to use. It allows fine graduation of the equatorial angle. Technically the AstroTrac wedge is optional. I think if you are to buy an AstroTrac you may as well get the wedge, as your realistic alternative is a Manfrotto geared head, or some other fairly heavy duty head or mount (remember the AstroTrac is larger than the Polarie) which is going to be as expensive or more, not suit as well and not be as compact. An advantage of the Polarie is the built in level meter which tells you what angle it is measured at. This is useful however it is very small, and the graduations much coarser than the graduations on the AstroTrac wedge. The AstroTrac combined with its wedge is extremely rigid and robust. The wedge is connected to the AstroTrac by three screws, there is no way the two are going to move or develop flexure. The wedge will not sag nor will the camera flop. In comparison the Polarie is attached to a tripod head using a single standard ¼” tripod bolt in the Polarie base and because of this I have often found it very difficult to tighten the Polarie to head sufficiently for a heavy camera and lens hanging to one side (pointing east for example) to not drift/sag slowly over time. I see this evident as star trails in one minute exposures. For the Polarie you need a very grippy plate it is attached to, and to make sure it is very tightly attached. I can leave the AstroTrac assembled with camera on-board attached to my tripod and slung over my shoulder to carry it. All will remain rigid and fixed. If I do the same with the Polarie something will usually sag as I walk along (attachment of Polarie to mount, usually), so in reality it is necessary to detach the camera from the Polarie, walk, re-attach. When on a sturdy tripod or pier the AstroTrac can hold enormous weight and do so without rigidity problems. I have no problem putting my 90mm refractor with camera or diagonal & eyepiece on the AstroTrac, or any camera/lens combination mentioned in the following paragraphs, but the combined weight of these exceeds the capacity of the Vixen Polarie. People do use the AstroTrac with portable pier to mount reasonable size refractors – 90mm, 110mm, etc. The AstroTrac will track accurately and easily with this weight. The Vixen Polarie is simply not designed for larger payloads and is not rated for the weight of a heavy DLSR with big lens or telescope. Mounting a Canon 7D or 6D with Canon 100-400mm lens on the Vixen Polarie is problematic. The same is true for a Canon DSLR with heavy lens suchas Tamron 24-70 when mounted vertically on a ball joint (portrait framing) where the balance is significantly to one side of the mount. The main reason for the problems with weight on the polarie is slippage of the mounting ring. There are two thumbscrews needing to be tightened and it takes considerable tension to tighten these enough to hold such a combination, even when well balanced. The problem is that these thumbscrews are relatively small and you can’t get your fingers completely around them to get perfect grip. This effectively limits the carrying capacity of the Vixen Polarie even if technically it’s motor can hold more. I can put 5kg of gear on the AstroTrac without problem. In contrast the most I would recommend for the Polarie is about 2kg. The Polarie is quoted to track up to 2 hours on internal batteries and with an external battery will track indefinitely. The AstroTrac will track up to 2 hours before requiring re-wind, but obviously requires external battery regardless. The AstroTrac gives you 10 minutes warning before the end of tracking by beeping and will then halt if not rewound first. Once re-wound you can continue tracking again. Between stopping tracking and starting again after re-wind the AstroTrac has a dead-time of about a minute, which can be inconvenient. For timelapse it is convenient that the Polarie can continue tracking indefinitely. This means you can leave the mount panning the camera across the sky for many hours, where as the AstroTrac has a limit of two hours. The different tracking limits means the Polarie is more suitable for time lapse panning than the AstroTrac. However for still long exposure photography the two hour limit posed by both mounts in different circumstances are of no consequence. Do you like retro or modern? The AstroTrac is very modern with futuristic curved lines, machined aluminium, clear acrylic cover which glows a subtle flashing green when active or solid green when inactive and stylish modern designed buttons. The AstroTrac is a head turner – everyone wonders what this space age looking thing does and how it works. It also looks great in astro photo’s because of the various soft red and green lighting it employs together with its shiny aluminium construction. The Polarie is very much retro, appearing at first glance more like an enamelled version of an old style film camera than a tracking mount. The finish is solid and clean with rounded edges and enamelled metal. The sides are plastic, and battery cover plastic perhaps a bit flimsy but that doesn’t detract from the high quality overall feel and retro design. The mode wheel glows a nice green to indicate the active mode, and the angle meter on the side glows a subtle red when on “lamp mode”. As you can see the price depends on what you choose to mount the Polarie on (or the AstroTrac for that matter). The AstroTrac wedge is extremely sturdy and easily adjusted at fine graduations and as such I think a ball head is not comparable to the wedge. However, there is no doubt you can use the Polarie with a lighter duty ball head (or other type of head) than you can the AstroTrac, due to he lighter weight and smaller size of the Polarie. As you can see in the photos above I use a single direction head for my Polarie, a head I happened to have from a monopod. Depending on exchange rate, postage costs, and retailer discounts you could well find one slightly cheaper than the other. This review only talks about the tracking heads. 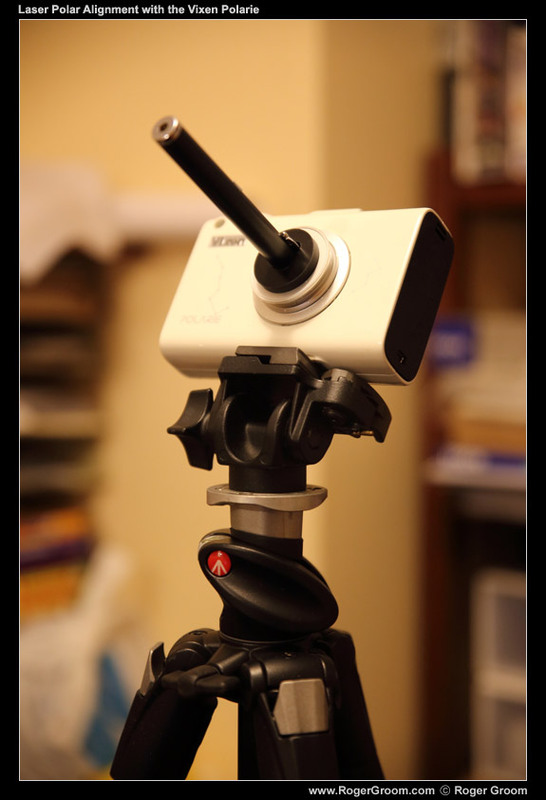 In addition to the tracking head for both mounts you will need a tripod, pier or such upon which to mount the head. I use a Manfrotto 055XPROB and Velbon E540 but the choice is limitless. The AstroTrac is available as a complete kit with pier, wedge and tracking head. This combination is excellent – very stable and very useful for larger telescope/lens combinations but keep in mind the pier will not adjust so well to uneven terrain (a rocky outcrop perhaps) and so suitable more to a travel telescope setup than a wide-field anywhere kit.